The scientific name for pigs are Sus scrofa domestica. A pigs tail can be straight, kinked or curly. Pigs are warm blooded mammals. Pigs are omnivores, which means they eat both animals and plants. Pigs are called boars, hogs or swine. Pigs grunt to communicate with each other. 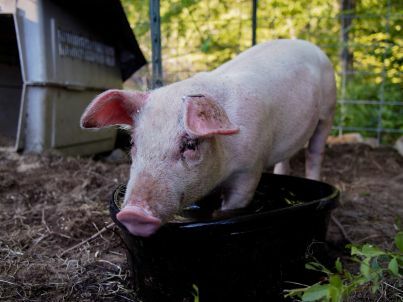 A pig sometimes rolls in mud because it provides protection against flies and other parasites. Pigs also roll in mud because it protects their skin from sunburn. Pigs can grow between 300 to 700 pounds. An adult female pig is called a sow, a male pig called a boar. To keep cool pigs roll in mud. The hair on a pigs skin are called bristles. A pig has a great sense of smell, but has poor eyesight. Its easier for pigs to learn tricks than dogs. A pig gives birth to eight to twelve piglets at a time. A pig sequel can get as loud as 100 – 115 decibels. The average life span for a pig is twelve to nineteen years. A pigs hoof has four toes. A pigs nose is called a snout. Pigs appear to have a good sense of direction. At birth piglets weigh about 2.5 pounds to 1.1 kilograms. A fully grown pig can drink up to fourteen gallons of water a day. Piglets are able to learn their name in two to three weeks. Humans have about 9000 taste buds, pigs have about 1500 taste buds. Mother pigs sometimes sing to their young while nursing. Pigs do not have sweat glands which makes them very clean animals. A group of piglets are called a litter or a farrow of pigs. Pigs are the fourth smartest animals. The Mini Maialino is the smallest breed of pig. Piglets learn to recognize and run to their mothers voices. Pigs originated from Eurasian Wild boars. Some famous pigs include Miss Piggy, Porky Pig, Piglet, Pumba, Wilbur and Hamm. A pigs lungs are not in proportion with its body. Pigs have small lungs. Unfortunately pigs can pass a plenty of diseases to humans. Wild pigs (boars) tend to have a camouflage color to its skin, to blend into their surroundings. Pigs are very social animals, they like forming friendships with pigs and other animals. A pig usually weighs about two pounds at birth and reaches up to 250 pounds in six months. Pigs dream just as much as humans do. The largest number of piglets ever born was thirty seven. More than half of the population of pigs live in China. A pigs skin can come in a variety of different colors like, pink, black, and white. Boars have two long teeth on the both sides of their moth called tusks. Domesticated pigs eat soybeans, ground up corn, and wheat. A mature pig can weigh about 500 to 700 pounds. The largest pig ever recorded was a Poland-China Hog, named “Big Bill.” Big Bill weighed 2,552 pounds.